Florida is the fourth most populous state in the nation, so the plethora of fix and flip opportunities there is not surprising. With so many places to invest, well advised flippers should have a strong grasp of the statistics surrounding any potential landing spot. Many well-known cities in Florida have a strong reputation in the flipping community. Below, we’ve compiled the state’s top 10 cities for investors. According to RealtyTrac data from Q1 2017, our list is based on cities whose flipping markets comprise the largest portion of the entire real estate market in that city. Once you’ve decided on the city you’d like to invest in, give us a call at 201-942-9089. Hollywood is one of many South Florida cities that made our list. Often lost in the mix between Fort Lauderdale and Miami, Hollywood is the 12th largest city in Florida. Investments here are lucrative. The typical deal generates a $65,000 profit for investors, the second highest figure on our list. Similar to Kissimmee, home values in Hollywood have risen 10.2% over the past 12 months. Hollywood has yet to develop as elegantly as neighboring Miami and Fort Lauderdale. However, its rising popularity may indicate a changing of the tides and a greater focus on Hollywood as a legitimate source of investment for the future. On the West Coast of Florida, a small town of 2,671 residents named Port Richey has a booming fix and flip market. A Pasco County city, Port Richey has a low median home value of $91,700, making it a perfect entry level investment location for investors! Small towns like Port Richey are perfect for new investors to explore. That is because newcomers can gain experience and turn a profit while not risking too much on a first deal. Shockingly, for such a small town, Port Richey had 64 flips in Q1 of 2017! Another well-known city in Florida, this South Florida gem is known for its beaches and its growing nightlife, restaurant, and shopping scenes centered on Los Olas Boulevard. With so much investment into entertainment and retail, residents are pouring in to buy up properties. With so many distressed properties to choose from, investors can identify highly profitable deals while investing in a city that has the potential to grow into one of the largest in the nation. Known for its beaches and bohemian vibe, Naples is an established and highly developed area that continues to be an excellent fix and flip location. A popular vacation destination for those fleeing from the cold, Naples is also extremely popular amongst retirees and other permanent residents. Prices surpass other traditional fix and flip areas due to Naples’ affluence, but more experienced investors with the ability to fund a project there have the potential to make an extremely profitable deal in this beach town. Known to have the 6th highest per capita income in the United States, flipping accounts for 18.5% of all real estate sales in Naples. 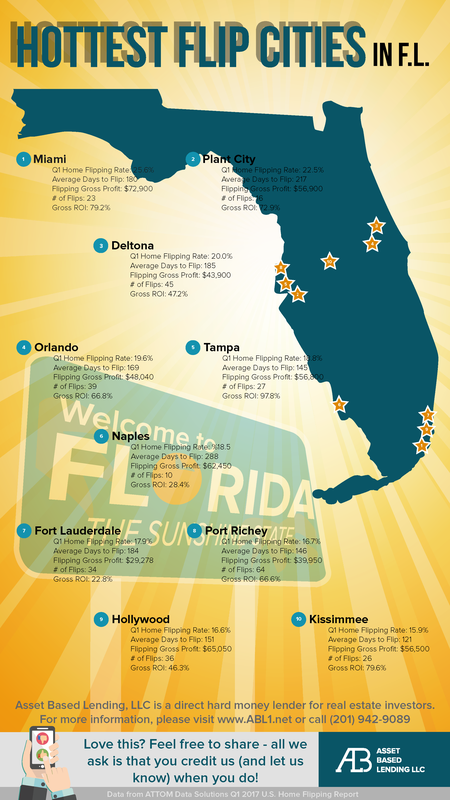 Tampa comes in at number 5 on our list flaunting an impressive home flipping ROI of 97.8%! Bordering the Gulf of Mexico and home to a number of professional sports teams, Tampa’s prominence as a major US city is growing yearly. Its population has been steadily increasing over the years as Tampa’s evolving downtown area continues to pull new residents. The 5th best outdoor city according to Forbes (2008), Tampa is home to many real estate investors. When investing in Tampa or any city near the water, it is incredibly important to flip quickly. Waterbound areas often require flood insurance not required by traditional properties. It may also be difficult to acquire a loan from a traditional bank for this type of property. Luckily, there are other options to consider. Still, properties near water should not be feared! Many buyers see it as a plus and it instantly raises the value of a property. Orlando has traditionally been famous for its theme parks and family attractions, but did you know it is a budding location for real estate investment? There were 39 flips in Q1 of 2017 in Florida’s largest inland city. Home to an international airport and a professional sports franchise, its popularity is growing and will continue to do so with a solid infrastructure in place. Home prices in Orlando have risen 11% in the past year and are expected to continue to grow at a rate of 4%! Nestled in the North East corner of Florida, Deltona is part of the same metropolitan area that includes Daytona Beach, home of the famous NASCAR Daytona 500, and a popular spring break destination. Deltona, however, is a mostly quiet residential area for commuters who work and play in the nearby metropolitan areas. This is the driving force behind its real estate development. Next to Port Richey, Deltona had the second highest number of flips in the first half of 2017 rounding out at 45. Known as the Strawberry capital of the world, Plant City’s real estate market is booming with home values increasing just under 10% in the past year. With a median home value of $164,000, Plant City is another good starting location for a new investor looking to get his or her feet wet in fix and flips. 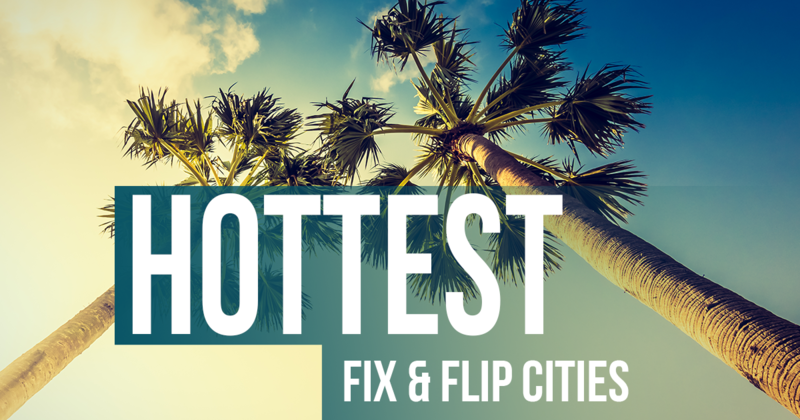 Internationally recognized for its nightlife, entertainment, and Hollywood screen time, Miami lands the number 1 spot on our list of the hottest fix and flip cities in Florida. Flips account for 25.6% of all Miami real estate activities. With an ample amount of foreclosures for investors to play with, the market is perfect for fix and flip deals. Miami continues to be a desirable place to live due to its weather and many entertainment options. With so many potential investment properties and an eager constant flow of new residents coming in, the real estate conditions in Miami look strong. Take a look at some photos of a project we funded recently in Coral Gables, a suburb of Miami! Pre-qualify today to learn about the possibilities. Please also feel free to pre-qualify and one of our Loan Officers will call you to discuss. My name is Jeffery. I have several below market residential single family houses in southern Florida. I have assignments contracts.